Ethnographic and archaeological objects in the Hudson Museum’s permanent collection exemplify the technological development, belief system and economic, political and social organization of their cultures of origin. 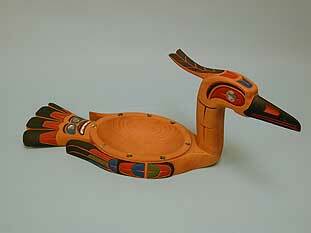 The collections include ethnographic material culture from North, Central and South America; Oceania; and New Guinea. Emphasis in collection development is in these primary geographic regions. The Museum also maintains a teaching collection of objects and reproductions used for hands-on instruction in educational programs, workshops, outreach kits and traveling classroom exhibits. To learn more about our holdings, please explore our collections. 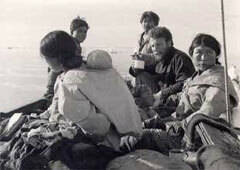 The Richard Emerick Endowment Fund was established in the University of Maine Foundation in 2000 in honor of Dr. Richard Emerick, professor of Anthropology and founding director of the Hudson Museum. T he fund supports Museum exhibits and programming, outreach to underserved audiences, acquisitions to the collections and preservation of the collections. Established in honor of Renee Minsky, a Hudson Museum docent and past member of the Hudson Museum Advisory Board, with a gift from Leonard E. Minsky in 1991, the Minsky Fund provides support for the Hudson Museum. The fund supports the furnishing of galleries and exhibit development, guest lecturers, publishing of gallery brochures and guides, and traveling or special shows exhibited in the Museum, as well as a new Minsky Fieldtrip Fund. Established by Linwood L. Colson III in 2000 in memory of David E. Shoemaker, a scholar in Latin American Studies, an adjunct assistant professor in The University of Maine Art Department and a member of the Hudson Museum Advisory Board, this fund supports the collections of the Hudson Museum, including graduate assistantships for collections research and management, acquisitions of objects, preservation of collections and collections-related publications. Cash gifts (including pledges), Appreciated securities, Real and personal property, Bequests, and Deferred gifts. To learn more about these endowments and other charitable giving opportunities, contact the University of Maine Foundation, 207.581.5100 or 800.982.8503, or email umainefoundation@maine.edu. Please write the name of the appropriate endowment on the memo line of your check. Over one million visitors from Maine and around the world have crossed the Hudson Museum’s threshold to witness “the wonder and splendor of the human experience” showcased in temporary and permanent exhibits, celebrated by special events and discussed in lectures by such distinguished scholars as Richard Leakey, Jane Goodall and Thor Heyerdahl. Through guided tours and gallery programs, thousands of Maine school children have an unparalleled opportunity to explore and understand the depth and breadth of the Earth’s cultural diversity. 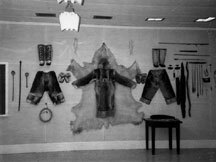 The core of the Hudson Museum’s original collection is pictured here, in the mid-1960s, as a classroom display created by the Museum’s founding director, Richard G. Emerick. Today, the Hudson Museum curates about 9,000 objects. See more on our collections.